Heat oil in a large nonstick skillet set over medium to high heat. Cook chicken, stirring often, for 5 minutes or until golden brown. Add garlic; cook, stirring for 1 minute. Reduce the heat to medium. Add soup, chili powder, lime juice, Worcestershire sauce and soy sauce; bring to simmer, stirring often, for 4 minutes. Meanwhile, cook pasta in unsalted water, according to package directions, adding green beans and corn to pot in last minute of cooking. Drain, reserving 1 cup (250 mL) of the cooking liquid. Return pasta mixture to pan. Add soup mixture. 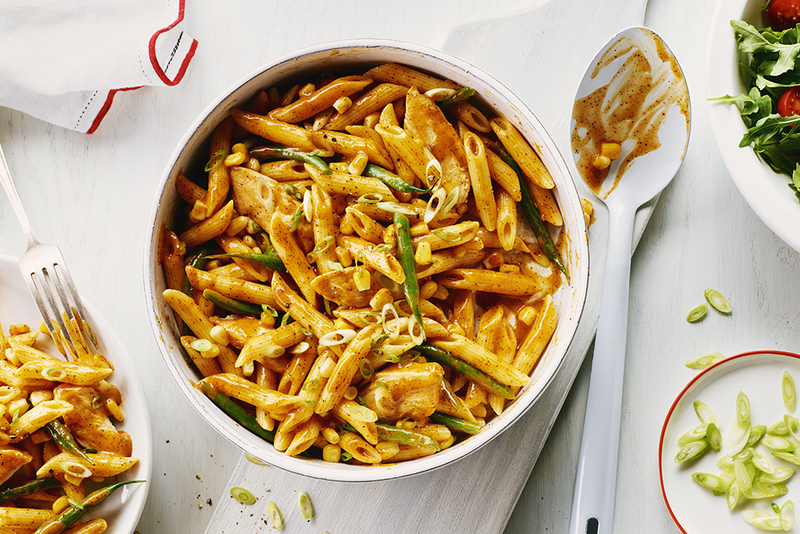 Stir in enough of the cooking liquid for sauce to evenly coat pasta. Sprinkle with green onions. 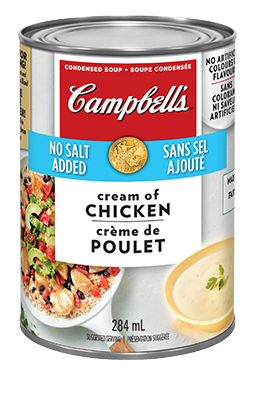 Using a no-salt added soup can help you control the sodium in your recipe. Season the sauce with a pinch of salt and top with a little grated Parmesan cheese, if you like. Leftovers are delicious reheated, or served cold like a pasta salad! I didn't miss the salt. For a boyfriend that hates tomatoes, cooking pasta is practically impossible considering anything tomato base is a no but this is a hit at my table! Tastes great and has a little kick to it!